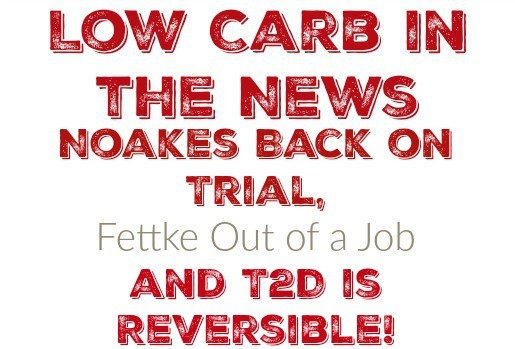 Dr Gary Fettke is out of a job – Strange that Noakes and Fettke are in the news the same week but it’s fitting as these men are going through essentially the same long slow torture for their low carb beliefs. Also interesting that in the article linked above he names a particular member of the hospital management that seems to be spearheading the effort to silence Dr Fettke and on the same day she is named and Dr Fettke makes his announcement, she quits. Her job is finished I guess. You can find my interview with Dr Fettke here. Do Carbs Make You Fat? – First of all, thank you to everyone who forwarded this article to me. You can stop now, I’ve got it. Let’s all remember 2 very important things when a new study that compares low carb to high carb dieting. #1 If the Low Carb intervention isn’t at least 6-8 weeks long, it’s worthless. It takes time to fat-adapt. This study was only 4 weeks long per intervention. #2 and this is by far THE MOST IMPORTANT THING TO REMEMBER! LCHF isn’t magic! It works because you feel satiated, eat fewer calories and lose weight because you eat fewer calories. That’s the secret. If your intervention makes the participants eat the same amount of calories per diet, you remove the ONE THING that makes LCHF work. Namely, the LCHF is satiating with fewer calories so you eat less food. That’s it, that’s the big secret to how LCHF works. 2 Diets where 2 groups are on equal calories will produces equal weight gain or loss. LCHF “in the wild” results in suppressed appetite, more satiety and fewer calories consumed. I understand the desire for scientific studies to hold as many variables constant as they can but if you don’t allow for the participants to pick and choose what and when to eat within the parameters of the diet, you remove the thing that makes the LCHF diet work. BTW, this is the exact thing problem that tanked the NuSI study from Gary Taubes. 1 Year Results from VirtaHealth – The 1 year results are out from the VirtaHealth and whaddayaknow, Type 2 Diabetes is almost entirely reversible with dietary intervention. Whodathunk it. You might check out Dr Sarah Hallberg’s interview on the Livin La Vida Low Carb show for more info. US Right to Know sues CDC for Documents About its Ties to Coca Cola – Now this is interesting. I hadn’t heard of US Right to know before now but I am intrigued! I hope they find a smoking gun. Dr Gerald Reaven Obituary – We lost a leader in the low carb world this week as the “Father of Insulin Resistance” passed away. He was the first to realize the constellation of diseases clustered around insulin resistance and called it “Syndrome X”, now call Metabolic Syndrome. RIP. PREVIOUS POST Previous post: I Had My Gall Bladder Removed, is the Ketogenic Diet Safe? NEXT POST Next post: What’s Sugar Free and Keto Friendly at Burger King?